Gotham City’s White Knight is one of many classic DC figures re-imagined under the Young Animal imprint. Violet Paige isn’t an alternate Batman, more of a rival, and her series is a showcase of different flavors. Written by Jody Houser, who also pens Rogue One for Marvel’s Star Wars line and Faith for Valiant. Mother Panic in a nutshell: a wealthy heiress loses her family to tragedy. Trained in combat, outfitted with pointy ears, cape, devices, she stalks Gotham at night, set on vengeance. Sound familiar? It’s not. Violet has a living mother, a team instead of a butler. Her ascension to becoming Mother Panic was forced upon her, not elected, and it has scarred her, inside and out. She isn’t a crime fighter. She’s a fighter. Just ask Katherine Kane. The series so far has featured three different art teams, and though it follows one cohesive story, each arc has a separate vibe. Here’s who and here’s how. Tommy Lee Edwards brings all the seriousness the start of the series deserved. Almost, but not quite, a traditional super hero artist, just a little better. Like Michael Lark, but with more detail. The glider and the suit, the architecture, cars, the thugs and the villains (Gala gets four pages and I am praying she comes back), even Batman and Batwoman. The costumes- literally, at one point, a dress-up party of Gotham villain parody- they are all perfect. What you want. What you need. Art that is crisp and perfect and just the right amount of sketchy. Absolutely fantastic, complex coloring. Lots of little, single panel asides of pertinent abstract imagery, bunnies sitting in skulls and milk pouring from a strawberry’s wound. Damn fine silhouette work and the blocked white of the Mother Panic suit being a shadow’s inverse. The action is dynamic. It hits hard, fast, efficient, sanshou fighting and writing and execution. Edwards set the bar at an incredible height. Shawn Crystal totally switches gears. A whimsical, dark simplicity that evokes Bruce Timm’s cartoons and the monsters of Steve Bissette in equal measure. The over-the-top expressions, edged teeth, and extension of bodies beyond anatomy to embody gesture all work. The seemingly silly brings out the darkness. It’s dreamy. The perfect way to tell a story about children’s nightmares realized, really. The art is indie-er. The colors are a throwback, too, large blocks of sunset and sea foam. There’s an Archie Comics Teenage Mutant Ninja Turtles thing going on for this arc, but full of mad surgeons and the Rat King has his minions chew off your face. The cryptic panels portraying Violet’s thoughts are turned into swirling patterns and textures, a fog of skulls and flames that lay like robes about the characters. Definitely an interesting choice for the series, a hairpin turn, but it totally succeeds. And then, John Paul Leon gives Mother Panic an elegance that cements its magnificence beyond argument. His grip on sparse clarity and meaningful detail is staggering. What we know- the gloves, the glider, the garden and the lab, it’s all boiled down to pure essence. The new stuff like a half-zipped body bag and a pair of pistols, reflections in blood, real menace from nearly nothing. Leon has style. His faces have presence. His compositions hang vibrant. The elements of crime- guns, alleys, tears- his wheelhouse is rendered with a loving familiarity, slick grace. The closest comparison I can draw is Dave Mazzucchelli, though with more shadow, less polish, edges instead of curves. Less is so so so much more. There is contrast here. The blacks are solid, the negative space masterfully employed, the colors blocked out in a way that enhances the gaps instead of filling them. He’s Eisner with a chisel-tip pen instead of a brush. 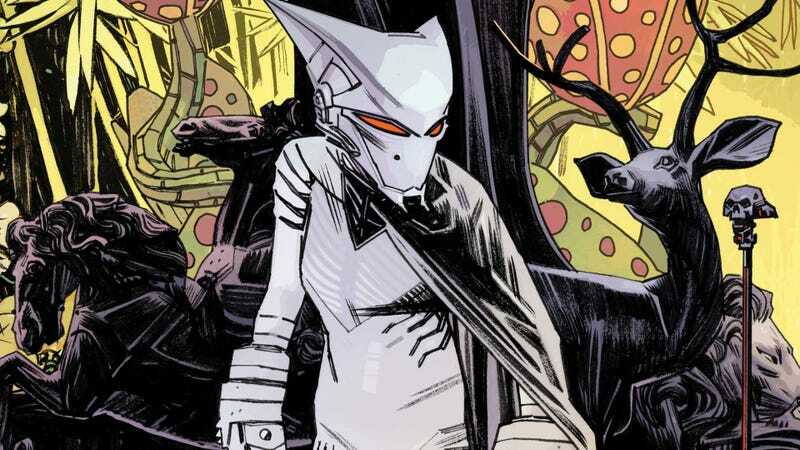 As much as I love his take on the Mother Panic costume, I could drink up an entire cask of his Violet Paige, sassy looks and pink camo pants, her crew, her school, the new strangers this arc introduces. A fully-formed visage alive with emotion in a dozen strokes or less. Guy is a master. Series is a masterpiece. Mother Panic was created by Jody Houser, Tommy Lee Edwards, and Gerard Way. It is lettered by John Workman (with Shawn Crystal during his run) and edited by Molly Mahan.